I've proved that the central XMonad StackSet module is safe on several occasions, as the code keeps evolving. Each time I take the source code, run Catch on it, and send an email back to the XMonad list giving the results. So far only one other person (Spencer Janssen) has taken the time to download and install Catch and run the tests to validate my result. The reason for this is that building Catch is slightly tricky, due to the Yhc and Yhc.Core dependencies. I'm working on putting together a proper release for Hackage, expect that within a month - all the code works, its just the packaging and user interface thats lacking. The other day dons asked me how he could "get an idea" of what Catch is doing. If you blindly accept a formal proof, its hard to get a feel of whether its correct, or if you are proving what you expect. The detailed answer is going to appear in my thesis (and hopefully as a paper beforehand), but I thought it may help to give a very light overview of what thoughts go through Catch. The concept behind Catch is that each function has a precondition that must hold in order for the function to execute without error. If a function f calls a function g which has a precondition, then the precondition for f must guarantee that the precondition to g holds. If you set this up so that error has the precondition False, then you have a pattern match checker. The second concept is that given a postcondition on a function, you can transform that to a precondition on the arguments to the function. If there is a requirement that the result of f x y meets a certain condition, then this can be expressed as conditions on the variables x and y. Before all this machinery can be put into action, it is first necessary to perform many transformations on the source code - filling in default pattern matches, doing simplifications, removing higher-order functions and abstracting some library functions. All these transformations are performed automatically, and are intended to set up the Catch machinery to do the best job it can. Catch identifies two separate potential pattern match errors in this statement. Firstly the lambda expression passed as the second argument to modify is potentially unsafe - as it does not mention the Empty constructor. A quick look at the modify function shows that by this stage the value must be a Node. The way Catch solves this is by transforming the code, bringing the two pices of code together. Once the case expression within modify is merged with the one in the lambda, pattern match safety is a simple transformation of elimating redundant alternatives. The second potential error is in the where statement. If reverse rs is empty then the pattern will not match. This is a perfect example of the postconditions in action, the generated postcondition is that reverse rs must be a (:) constructed value. Using the machinery in Catch, this condition is transformed into the condition that rs must be a (:) value. Looking at the alternatives, Catch can see this is always the case, and declares the pattern safe. In order to prove the entire module, Catch requires 23 properties, and 12 preconditions. The process takes 1.16 seconds are requires 1521.05 Kb of memory. Catch is an automated tool - no user annotations are required - which means that some people may feel excluded from its computational thoughts. If a user does wish to gain confidence in the Catch checking process, a full log is produced of all the preconditions and postconditions required, but it isn't bedtime reading. Hopefully this post will let people get an idea for how Catch works at a higher level. I am very glad that Catch is an automated tool. XMonad is a fast changing code base, with many contributors. In a manual system, requiring proofs to remain in lockstep with the code, the pace of progress would be slowed dramatically. Hopefully Catch can give cheap verification, and therefore verification which can be of practical user to non-experts. I use both GHC and Hugs for my development work. I primarily work with WinHugs for development, then move on to GHC for deployment. Unfortunately one of the things that WinHugs doesn't do very well is CPP support, it can only be turned on or off for all files, and requires multiple passes and slows things down. So what you really need is some way of defining code which executes in the presence and absence of CPP - so you can customise correctly. The non-cpp contains an extra open comment, which nests the comments, and leaves the definition invisible. With these two fragments, you can customise your Haskell code so that it performs differently on systems with and without a CPP, remaining valid Haskell on sytems with no knowledge of CPP. * This is building on from last time. In particular, that means that all the same disclaimers apply. The C code is quite hard to write. In fact, this code is the original version I wrote - with an accidental mistake. Rest assured that I benchmarked with the correct code, but see if you can spot the mistake. And the numbers: C=4.969, Supero=5.063, GHC=9.533. This time the difference between C and Supero is a mere 2%. 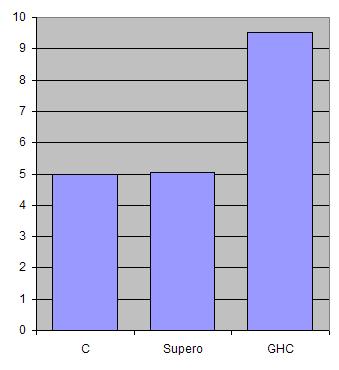 However the difference between Supero and GHC has grown considerably! The reason for this is an advanced optimisation that has managed to remove all the intermediate lists. In a normal Haskell program, getContents would build a list of characters, lines would take that list, and build a list of strings, then length would take that list and consume it. With my optimisation, no intermediate lists are created at all. While in the previous benchmark it was easy to examine and understand the generated GHC Core, for this one it is much harder. 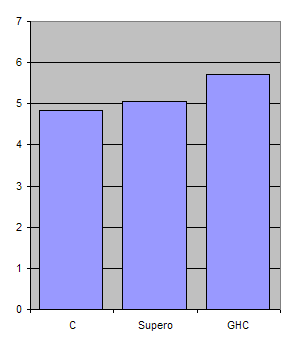 The benchmark has ended up using a recursive group of functions, none of which use unboxed numbers. For this reason, I suspect that the benchmark could be improved further for Supero. Once again, credit needs to be given to GHC for the results - it is clearly doing some clever things. This benchmark is slightly more interesting than the previous one, but is still a bit of a micro-benchmark - not following a real program. My next task is to probably move on to "wc -w" to complete then set, then a real benchmark suite such as nobench. I hope that this demonstrates that Haskell can be beautiful, pure, and match C for speed in some cases. * As usual, I'm going to qualify this with "on one particular benchmark, on one particular machine, with one particular set of following wind". I've been working on optimisation techniques for the last week, as one chapter of my PhD is likely to be on that topic. The approach I'm using is to take Yhc.Core, optimise it at the Core level, then spit out GHC Haskell which can then be compiled. The optimisation technique I've been working on can best be described as "deforestation on steroids" - its entirely automatic (no notion of special named functions like in foldr/build etc) and isn't too expensive. The particular benchmark I've been working on is "print . length =<< getContents" or "wc -c". In order to make it a fair comparison, I require that all implementations use the C getchar function at their heart for getting the next character - not allowing any buffering or block reads. This is actually a substantial benefit for C, since in Haskell things like clever buffering can be done automatically (and GHC does them!) - but it does result in a test which is purely on computational crunch. The actual numbers are C=4.830, Supero=5.064, GHC=5.705. This makes Supero 5% slower than C, and GHC 18% slower than C. The reason that Supero is faster is because its managed to deforest the length/getContents pair. The inner loop in Supero allocates no data at all, compared to the GHC one which does. Supero allocates 11,092 bytes in the heap, GHC allocates 1,104,515,888. This benchmark is not a particularly good one - the task is simple, the computation is minimal and most expense is spent inside the getchar function. It is however a good place to start, and shows that Haskell can get very close to C speeds - even using standard type String = [Char] processing. Supero has made global optimisations that GHC was unable to, and does not have any techniques with which it could acheive the same results. GHC has then taken the Supero output and automatically identified strictness, performed unboxing/inlining, and done lots of other useful low-level optimisations. I'm going to move on to "wc -l" next, and hopefully onto the nobench suite. The techniques used in Supero are all general, and I hope that as the complexity of the problem increases, the payoff will do so too.